There was no mystery as to which team Varun Pemmaraju was supporting: His American flag was tied around his neck, the Stars and Stripes floating like a cape behind him. Patriotism and the Olympic games have long gone together, but gone are the days when one just waved a flag. Now flags are worn. 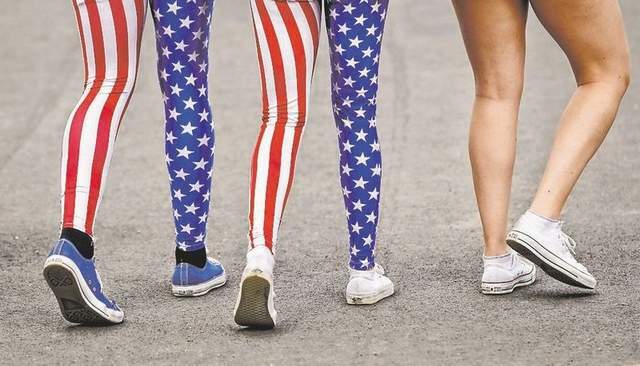 The fashion flags can be found at Olympic Park and around London as shift dresses and smocks, pants and shorts, hats and shoes, even dangly earrings and bracelets. There’s apparently no garment — nor nail polish — that can’t be fashioned into something akin to a national banner. Although the sponsorship police at the International Olympic Committee can stop merchants from using the five Olympic rings, there’s no trademark police on flags. Besides, capitalizing on a good fashion idea is not new. In recent years, “fast fashion” has transformed the retail industry, as mainstream companies seize the hottest ideas from the catwalk, copy them as quickly as possible and move them onto the shop floors. Some manufacturers have gotten so fast they can produce wearable creations from factory to store in the same season in which they were created by top designers at Chanel, Ralph Lauren or Dior. Before the games, American athletes were briefed on how to hold the flag should they be lucky enough to win. The U.S. Olympic Committee pointed out a picture of swimmer Missy Franklin displaying the flag properly after winning gold — right hand on stars, left hand on stripes. But fans at Olympic Park were wearing the Stars and Stripes were doing so in joy and exuberance — honoring the flag in their own little way.